As many of you know, I have been following the progress of little 8 year old Faith as she battles the horrible disease Cancer. What I hadn’t really talked about is that Faith had a friend Ethan who was also from Southern Oregon and was just across the hall at the Children’s Hospital. If you like mynewfavoriteday on Facebook, then you also know that Faith was going home yesterday to being hospice care in her home. Ethan and Faith were in their battle together and so my heart is very heavy to report that Ethan died yesterday shortly after Faith left the hospital to go home. It is like a true love story with the deepest of friendships founded on complete purity. For some reason outside of the obvious tragedy of this story, my heart is torn to pieces for these families. Maybe it’s because, I know what it’s like to have your children on the brink of life and death and watch them fight for every moment while all you can do is love them, pray, and pour all of your energy into capturing each moment in your heart and mind, or maybe it’s because these little ones and their families are such examples of love, faith and hope. Everyday waiting, praying and hoping for their miracle. The other night as I got ready for bed, I went in to chat with my dad who is visiting and is friends with these families and we were talking about we wondered if Faith knew she was going on hospice and what that meant. Since this conversation would ultimately result in the conversation that she will likely be passing over to the other side we started to talk about that conversation with a child. My dad told of something he had read about how children are often less afraid of death than adults because they believe whole-heartedly in heaven. It was such a pure statement and the truth of that I could feel as I went back to my 8-year-old self in church every Sunday and my pure belief in all things heavenly. It’s not to say my opinions or beliefs are different now, but merely that I have had a lot more years to ask a lot more questions and figure out my own spiritual beliefs; whereas, as a child I simply believed. This post however, is not about heaven or believing in God, it’s about these moments of life and how every one is an opportunity to make a new memory. Last night as I was running around trying to unpack and get myself sorted before Nana H had to leave for the day, Q kept going to the screen door to the outside because Poppy was sitting out there after an intense afternoon of brush clearing and he wanted to go out. 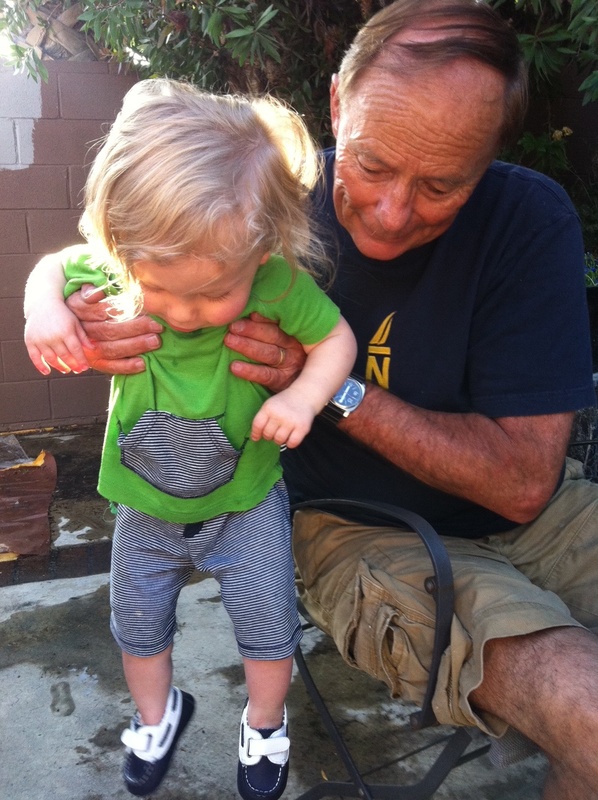 As Q just recently started really walking he has not really worn shoes ever. So, instead of running the empty box out to the dumpster like I so desperately wanted to, I ran back to Q’s room where I had just unpacked his shoes and came back to put them on this little feet so he could walk around outside. Since the house has been under construction, going barefoot was not an option so shoes it had to be. As Q tried to acclimate to his new kicks, he stumbled a little but smiled at his new ability to walk outside. He little face beamed with pride and my heart-felt the joy of watching Q and Poppy and knowing this was a special moment. This morning I was yet again reminded of this, as I went into the kitchen to unlock the door for Nana H and get Q set up in his high chair. As E has been not been too mobile, I left her in the room with KSP. From the front of the house I could hear the shower and then suddenly a cry. The loud piercing kind that makes your heart stop of second and your hands shake. E often crises like this when she is trying to make a poopy but for some reason in my ears this cry was different. As I hurriedly buckled Q into his high chair, I made the decision (or rather followed my instincts) to run back to our room. When I rounded the corner I was frightened to see poor baby E lying face down on the floor. Our bed is high as we are in a temporary frame and she had clearly rolled off..as she lay there she was also clearly shaken and crying. I swooped her up and held her close and looked for bumps…big bumps. There wasn’t any and it appeared that perhaps she did not hit the hard wood floor dead on but may have had her fall partially broken by a decorative bed pillow. We had taken for granted that E wouldn’t move from her spot on the bed where she was sitting and suddenly it all changed and it only took an instant. She didn’t cry for long (again super strong) but the effects for us were more lasting. Worry and guilt…but then those moments too have to pass. We went and got the playpen which will now be in our room once more and E will no longer be left unattended on the bed. While this was scary there is a moment of joy in that E became mobile in her own way. We can no longer assume that she will stay put which means she is making progress so for that moment there is joy. So so so many moments in our daily lives. This morning after the “rolling off the bed incident” I took a couple extra seconds before going out the door for work and noticed when my dad left to go to the hardware store and got on the floor and chased Q around and held E for a few extra seconds. These are the moments, the pictures I take in my mind. Today is a good day to keep your mental camera handy. Kiss your spouse a little extra long, hug your kids, laugh with someone, remember a family member and let them know, admire the sunshine, take a deep breath, smile and feel the light in your heart, tell someone you love them, remember something important about a friend, whatever it is, capture the moments and hold them dear. Tragedy and joy and both part of life and making each day yournewfavoriteday can be a challenge in times of great despair. To remember those moments of joy and to surround those going through something with your love is all we can give but those moment create memories that last a lifetime and allow all of us to move forward and create each day to be our own newfavoriteday. ← Empowerment is contagious, no chainsaw required. My heart aches for those parents. Just aches. I read this entry after responding to a comment about depression, and suicide. These two things taken in conjunction mean I’m starting the day with eyes open to all the wonders in my life, and a sense of commitment to both experiencing them fully and sharing that love felt in the presence of these often people-shaped wonders. Thank you. I know, it so heartwrenching. It sounds like your morning has been quite full and that these posts weighed on your heart, but I love that you are channeling the emotions into focusing on the elements in your life that you can cherish and share with the people you love & love u. Interesting that you posted about this this week. Aidan was asking a lot about Death and I found out my mom has Cancer in her eye. Both very relevant and parallel in different ways to your post. I explained Heaven mostly to Aidan and in his 8 year old wise world he says to me..”It’s bitter sweet isn’t it momma? You go to see the people you love and miss and you leave the people you love and miss”. What an old soul my 8 year old has. Nice reminder to remember the positive and never take a moment for granted. Life is short. Oh boy…I am so so so sorry to hear that about your mom. I will say a prayer for her and your family. Such an old soul…and what a beautiful statement. I am thinking of you all. Wow, I love how raw and real your blog is. Too often I think bloggers just share the ups in life and not the downs, yet you turn the downs into lessons and messages which is just so beautiful. Thank you for commenting on my blog so I could find yours. I know exactly what you mean. Every time I find myself caught up in petty worries, I try to remember how quickly everything I have could be gone. I’ve had a couple of close calls with my two kids (once my two year old ran out into the middle of the street– a heart-stopper) and on the one hand, it’s torture to think about how just one extra second could have changed everything, but on the other hand, it helps to have those moments because they remind me of life’s preciousness. Thanks for reminding me again! Oh my goodness, that is so scary! A heart stopping moment indeed but as you say it’s something that can ground you as well. There is nothing that will make you stop and appreciate all that you have faster than a close call. We all know this of course, but like everyone I too need to be reminded now and then.